Sony Picture Entertainment hack was one of the most devastating hacks in the history that leaked several hundred gigabytes of sensitive data, including high-quality versions of five unreleased movies, celebrity phone numbers and their travel aliases, private information of its employees, upcoming film scripts, film budgets and many more. Now, these large troves of hacked Sony data have been republished by Wikileaks. WikiLeaks on Thursday released "The Sony Archives," a fully searchable online database containing more than 30,000 documents and 173,132 emails that, it claims, were stolen from last year's Sony Pictures hack, proving a devastating and embarrassing security failure for the studio. ...Wikileaks – best known for revealing classified government and military documents – republished hundreds of thousands of emails, documents, and other sensitive information in a "fully searchable" format. Julian Assange – "The documents deserve to be easily accessible." "This archive shows the inner workings of an influential multinational corporation," WikiLeaks editor-in-chief Julian Assange said in a statement issued on Thursday. "It is newsworthy and at the center of a geo-political conflict. It belongs in the public domain. WikiLeaks will ensure it stays there." ...the documents they published also show Sony's close ties to the United States Democratic Party and its efforts for collecting 'intelligence' on rival studios, including Oliver Stone's latest movie on former NSA contractor, Edward Snowden. 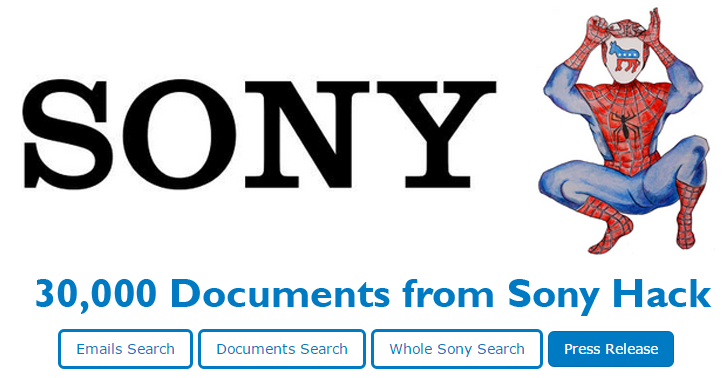 According to Wikileaks, The Sony Archives details email exchanges between Sony Pictures Entertainment and the White House, with nearly "100 US government email addresses" in the published database. "The work publicly known from Sony is to produce entertainment," Wikileaks said. "However, the Sony Archives show that behind the scenes this is an influential corporation, with ties to the White House, with an ability to impact laws and policies, and with connections to the US military-industrial complex." The Sony Pictures Entertainment hack was the result of the satirical movie "The Interview" — the Seth Rogen and James Franco-starring comedy centered around a TV host and his producer assassinating North Korean dictator Kim Jong Un. The hackers who call themselves the "Guardians of Peace" were apparently trying to prevent the release of The Interview. The FBI traced the hackers to North Korea.